Are You a Good Candidate for Dental Implants in Belchertown? One of the great benefits of dental implants in Belchertown is their ability to treat a wide range of dental problems, from a single missing tooth to complete tooth loss. Your implant dentist will work with you to tailor a treatment strategy to your needs. While implants can last up to a lifetime, it’s important for the patient to practice good self-care steps, including daily oral hygiene as recommended by a dental professional. A single tooth restoration uses a small titanium fixture embedded beneath the patient’s gumline. During the initial treatment, the dentist will expose a portion of the patient’s jaw and drill a small hole into the bone itself, into which he or she will place the fixture. For the patient, this is a gentle, comfortable procedure that uses anesthesia and usually sedatives to prevent anxiety and discomfort. During the post-surgical period, the surrounding bones will fuse to the fixture through a natural process called osteointegration. Once this is complete, the patient will return to the dentist for the fitting of the abutment. This is a small titanium connector that joins the embedded implant to the visible restoration; then the restored tooth itself is placed. Once this step is complete, the patient can show off his or her smile to the world. 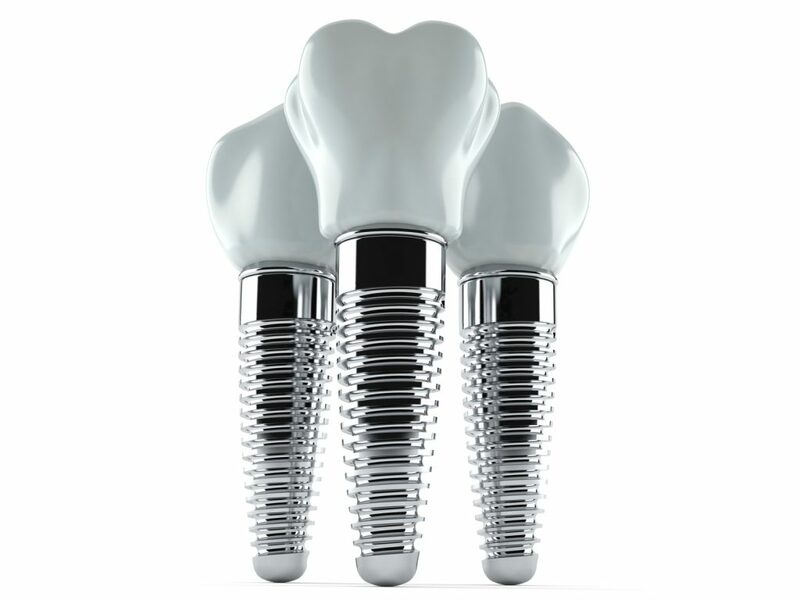 Multi-tooth implants use an approach that is similar to traditional dental bridgework, except that the restoration is supported by titanium implants. The dentist embeds between two and six fixtures in the patient’s jawbone, depending on the number of teeth that needs restoration. 3-4 missing teeth may only require a single pair of fixtures, while a restoration stretching across the entire arch may use as many as six. Once osseointegration is complete, the patient returns to the dentist for the fitting of a multi-tooth bridge. The advantages of using bridgework include reduced cost and shorter recuperation times for patients. Once this step is accomplished, the restoration looks and acts just like healthy natural teeth. Adhesive dentures have helped millions of people to enjoy a better quality of life. However, the benefits they offer patients are limited by the fact that they are held in place by pressure against the gums, not by any connection to the jawbone. This means they can come loose at any time unless the patient uses constant care and avoids certain foods and activities. While adhesives can help to minimize this problem, they can never correct it entirely. Implants suffer from none of these disadvantages. The wearer can enjoy his or her favorite activities, eat a normal diet, and participate in an active social life, free of worry about the restoration failing unexpectedly. Implants are not the best option for all patients. Only a qualified dental professional can prescribe the best solution in your case. Make an appointment to see an implant dentist in your area soon. You’ll soon have lots of reasons to smile. Dr. Mark D. Medaugh, known affectionately to his patients as “Dr. M,” is a skilled dentist who specializes in cosmetic and restorative techniques such as implant placement. He’s a member of the American Dental Association and Massachusetts Dental Association. You can reach his office online or by calling (413) 323-4335. Comments Off on Are You a Good Candidate for Dental Implants in Belchertown?